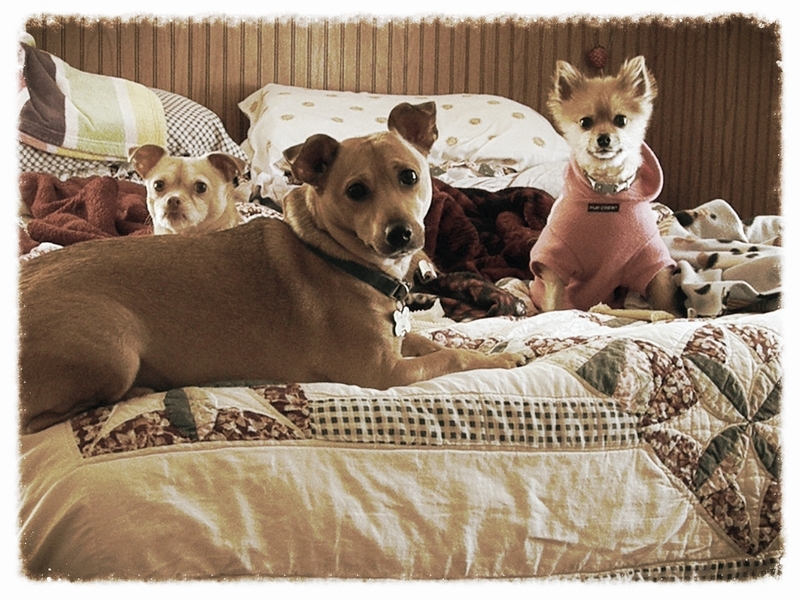 Our Bodacious Dog Mom Life: Next Year, We're Purchasing A King Sized Platform Bed. Next Year, We're Purchasing A King Sized Platform Bed. I took this photo in March of 2015. Lobo had joined our family as a foster the day after his surgery to remove his hind leg that January. In February, we adopted him. At the time, our bedroom was in the back room. Our bed was on a frame. Although the bedroom was small, it was warm and cozy and decorative and everything that a bedroom should be. Then, in January of 2016, Lobo while playing, fell off our bed. Thankfully, he wasn't injured. He landed on all 3 legs. But that didn't make Lisa or I any less traumatized. Right around the same time that year, Coco was diagnosed with Stage 1 of a floating kneecap. He started taking canine glucosamine. It has helped. But, his jumping mobility had decreased a tiny bit. We immediately made the decision to remove our bed frame. The safety of our kids is a priority. We wanted Coco to be able to jump on and off the bed with ease. And, we didn't want Lobo to fall off the bed again. We were lucky the first time, but we didn't want to risk a second fall. During our Big Bodacious Painting Project back in May, we moved the bedroom from the back room to the middle room. Despite the fresh coat of paint and the decor, the boxspring and mattress on the floor look like total crap. I'm over the fact that it looks like total crap. What matters the most is that Coco can jump up and down freely and if Lobo were to fall off, he won't be injured. But, that doesn't mean I haven't looked into alternative bedding that veers from the typical box spring and mattress. Next year, our goal is to purchase a King Size Platform Bed. With 4 rescue furry kids, Lisa and myself, the extra room is much needed. And, the platform bed style will be low to the floor.